Since a near fatal car accident involving a semitrailer, a helicopter and an off-duty paramedic, Webby has dedicated his life to becoming the multi-dimensional songwriter he is today. Delivering powerful melodies over punk infused trap beats, his supporters have come to understand there is much more to Webby than your average Soundcloud MC. Whether he sings about the trauma fuelled drug abuse of his late teens or raps a verse about his obsession with hello kitty, Webby is fluent in creating landscapes that capture his audience and bring them into his own unique world. As his profile has steadily risen, he has quickly become the it-boy of Melbourne’s prominent youth counter culture. With major appearances at Laundry Bar (including launch party of Getting There Slowly), Gasometer Hotel, Section 8, Boney, Grace Darling and more, Webby has become a beacon for the mosh-pit loving rap music fanatics of Melbourne. 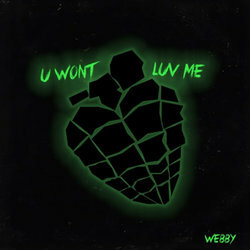 With releases such as Cut, U Won't Luv Me and Backstreets Webby has proven his place in the music community both online and IRL. Receiving high praise on prominent music blogs such as AUDollars, Issa Rap and ELEVATOR, he has already begun developing a world-wide audience. A heartfelt melodic track with lo-fi guitar samples and a deep, booming 808. Emo rap/pop punk inspired.